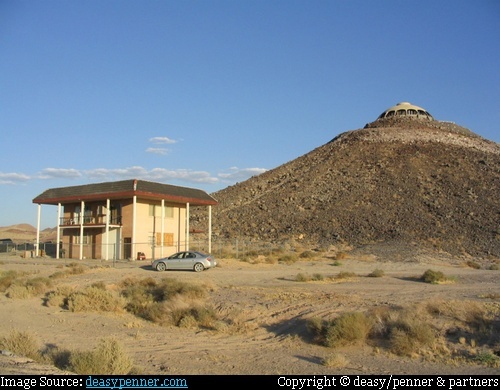 This amazing house which looks like an astronomical observatory is actually a private home built on the top of 150-foot cinder cone of an extinct volcano in the middle of Mojave Desert between Las Vegas and Los Angeles. 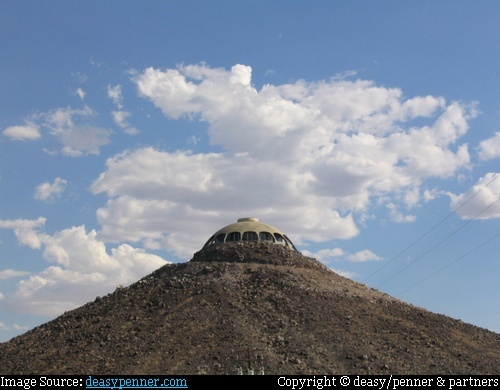 Located in Newberry Springs, CA, USA, "The Volcano House" was designed in 1968 by architect Harold J. Bissner Jr. for American engineer and businessman Vard Wallace who was an astronomy fan and owned the 60 acres desert area containing the cinder cone. 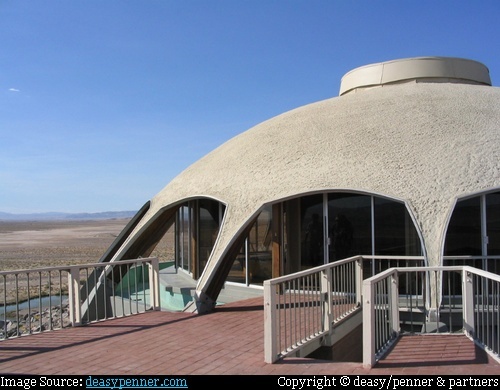 The 1,800-square-foot two bed rooms with a guest room home has a circular overhanging shaded deck all around the living space which offers a 360 degree panoramic view of Martian like landscape. Reportedly Lucille Ball of "I Love Lucy" fame had also stayed in the house as a guest of Wallace. 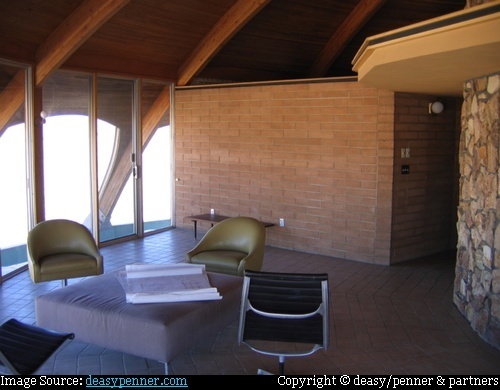 Till recently the house was owned by Huell Howser, the American television personality best known for the TV serial 'California's Gold' and reportedly few months back it was on sale for an asking price of USD 750,000. 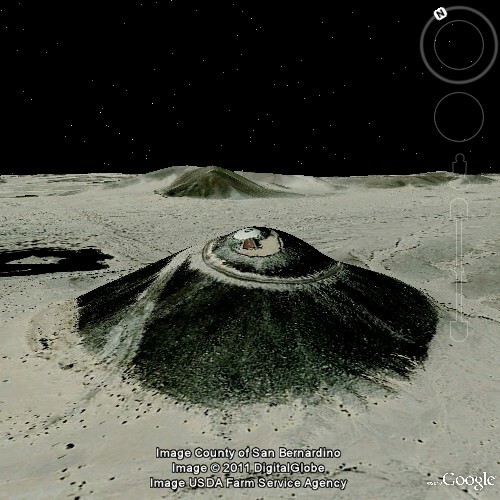 Present status of ownership is not known. Since it is a private property I request my readers who are visiting the area to please respect the privacy of the owners. 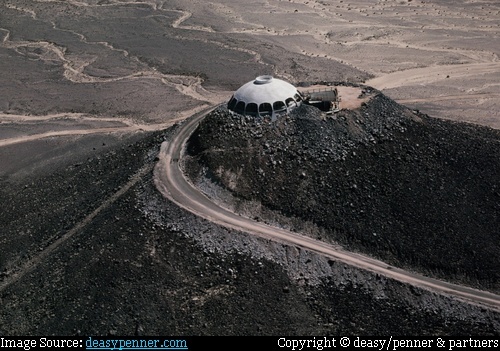 Source of info and more info and images: Vegas Seven and official web site of deasy/penner&partners. Copyright: Images from deasypenner.com are copyright © deasy/penner & partners and are used here after due permission. Credits: I am thankful to Mike Deasy (www.deasypenner.com) for giving me permission to use images from official web site of deasy/penner&partners. Thank you Mike!